A combination of different clovers in grazing and silage swards is helping Coleraine organic milk producer Rex Humphrey secure his total protein requirements from home-grown sources. “We take three cuts of silage each year, which will have an average 20% protein content. “The grass is ensiled following a 24-hour wilt. The trick in managing red clovers properly is to raise the cutter-bar of the mower an inch above what would normally be the case. This ensures that the growing tip of the clover plants is not cut. The Humphrey herd, comprises 300 cows. It is split 50:50 between autumn and winter calving. The cows, predominantly Friesian/Rotbunt crosses, are currently averaging 7,500L with 1.25t of concentrates fed. Swedish Red bulls are now being used as a third cross option. “Under Soil Association rules concentrate feeds can only account for between 40% and 60% of total milk output,” said Humphrey. The Humphrey herd was established in 1999. It is part of the United Irish Organics’ Group. “We are currently getting 35.5ppl for all our milk. The break-even price is 25p,” he said. Regular foot bathing is a core component of the management practises followed on the farm. Rex Humphrey recently invested in a bespoke 900mm wide Moore Concrete footbath. It is now part of a two component system which includes a pre-wash and solution-filled baths. “The new set-up allows us to put the cows through the foot bathing system as often as we want after they leave the milking parlour. Regular foot bathing is critically important when it comes to preventing lameness. Moore Concrete’s Jeff Haslett was a recent visitor to the Humphrey farm. “We manufacture a range of standard foot bath sizes. These vary in length and width but are normally 1100mm in width,” he said. “When filled, they contain solution to a depth of five to six inches. The baths can be easily emptied, simply by pulling out the bung. “If the baths are placed on slats, the effluent falls into the slurry tank below. Increasingly, we are manufacturing bespoke footbaths to fit in with unique locations in either slatted houses or in passages leading to or away from milking parlours. 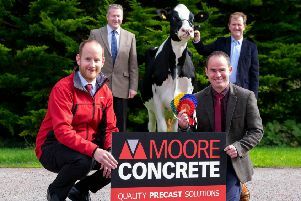 Further information is available at www.moore-cincrete.com, alternatively contact a member of the Agriculture Team at Moore Concrete on (028) 2565 2566 Ext 1.